The purpose of MarineRegions is to create a standard, relational list of geographic names, coupled with information and maps of the geographic location of these features. In order to preserve the identity of the marine geographic objects from the database, and to name and locate the geographic resources on the web, MarineRegions promotes the Marine Regions Geographic IDentifier, or the MRGID. MarineRegions is managed by the Flanders Marine Institute (VLIZ). Funding for the creation of the VLIMAR gazetteer was provided initially through the EU Network of Excellence MarBEF, but also other European initiative such as EMODNet and Lifewatch provide the necessary funding for the maintenance and management of MarineRegions. MarineRegions uses several sources: marine boundaries, ecological classifications, fishing zones, thematic gazetteers, regional gazetteers, global gazetteers and several others. MarineRegions provides numerous web services which allow the user to have direct access to the geographic data, maps and metadata from a GIS desktop or for online applications. 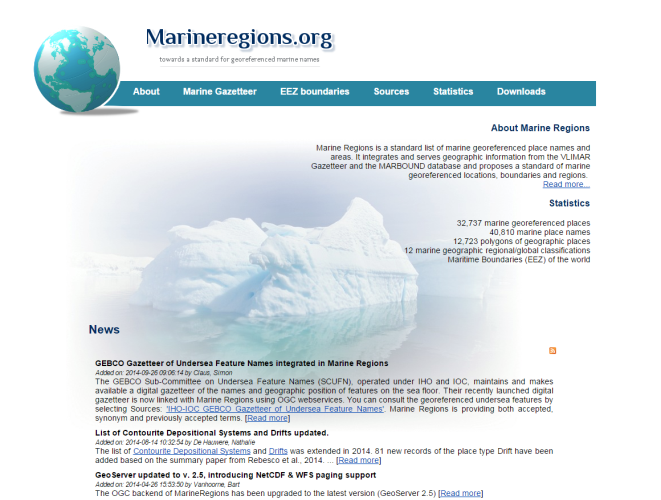 Currently MarineRegions provides the OGC services WMS, WFS and CSW.